When it comes to kicking off a project we usually focus most of our attention and energies in moving the project from beginning to end. For some of us, there is excitement in the start of a new project and a sigh of relief when the project ends (with a whole lot of hope and nail biting in between). Not long into the life of a project there comes a sobering reality of the tedious tasks that are required to make a project successful. Our follow through with these tasks are principal to the outcome and overall success of the project and ultimately how customers perceive us. Follow through is best achieved within a team environment where every member of the team is using their strengths to maximize the effort given towards the project. Within a team there is a greater level of accountability and creativity that leads to effective communication and clear direction. Clear direction leads to efficient work flow and easy identification of bottle necks and other potential problems making your project economical and creating greater margin within your business. Don’t forget to conduct follow up meetings regularly to track progress. These brief meeting should be done at the beginning of the day, be brief, and cover what top tasks each team member has to accomplish that day. Above all, have fun! The more you enjoy your team and project, the greater strength you have to complete the tasks you have throughout your day. The economy has certainly effected work loads and the kind of work many shops are doing this year. In previous years it wasn’t unusual to have a back log of 6 or more months on new products. This year a back log of 2 to 3 is normal for most ASME fabricators. Although the work isn’t coming to us as in years past there are still plenty of opportunities. We have found that there has been a steep increase in repair, recertification, and rerate work for ASME vessels. As one of the few shops with a “S”, “U”, “NB” & “R” stamp we have been able to pursue a broad range of work with clients looking to make due with current equipment. This is a great way to finish projects and keep the bottom line as low as possible. Rerating a vessel can keep a project moving forward using equipment that has already been paid for. 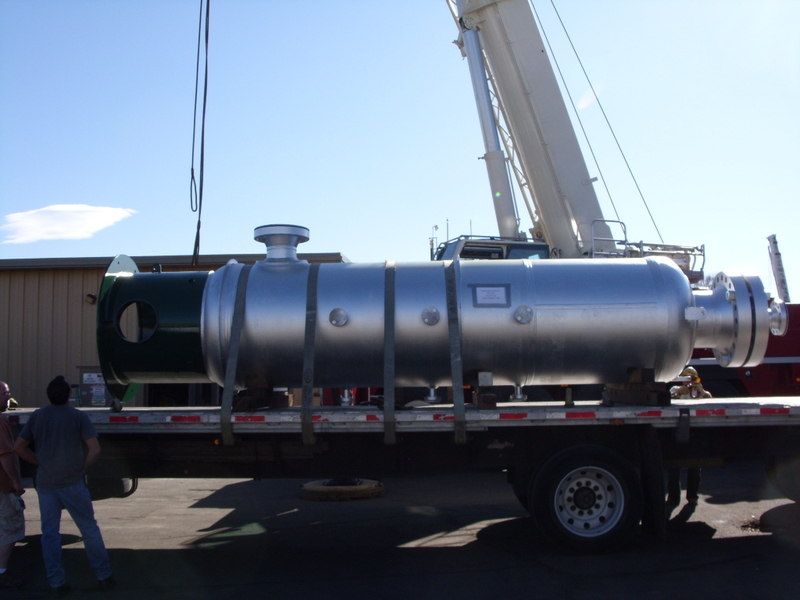 Comparatively, rerating or re-certifying a pressure vessel is a mere fraction in price and time but the results are the same. Another great option is finding and reimplementing used equipment. Let’s face it a used tank or vessel will be useful long after any of us are around to care. As a practice in good stewardship not just during tough times using used tanks and vessels can save substantial capital and bring more projects to our companies and to an ultimate completion. In the meantime companies looking for good deals on new equipment have a lot of buying power at this time too. Many shops will be able to provide the same equipment quicker than previous years at reduced rates. End users that have not seen price reductions on equipment should shop around and see if your vendor has become complacent in providing the best deal possible.